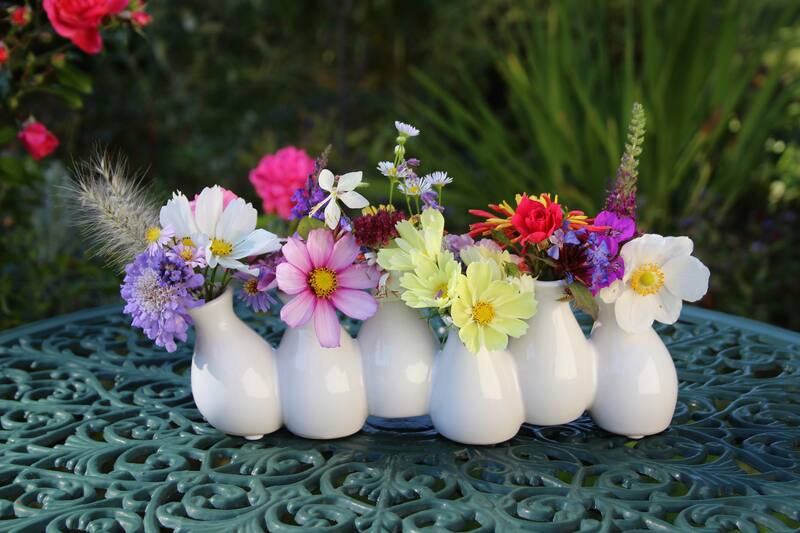 I received a lovely gift last week – a vase that is in fact six vases, filled with flowers from my friend’s garden. It has since been refreshed with some extras from my own garden and is looking very colourful as a table decoration! It is divided into two chambers, each with three ‘vases’, which makes filling and topping up easier than six individual ones. And it seems to be dancing, as not every vase is standing flat. … Geraniums, Asters, Roses, Sedums and Feverfew. Teucrium, Lavender, Pennisetum, Linaria, Japanese Anemone and Leadwort. What a cute little vase and the filling is delightful too but then I wouldn’t expect anything ordinary from you, dear Cathy! Happy Monday 🙂 That yellow Cosmos is breathtaking! That is just adorable. The vase is pure happiness. What a wonderful gift. Trust another gardener to find the perfect vase. I never would have guessed that was a Zinnia. Thought it was a Dahlia. And a group of vases like yours are so much fun to fill, aren’t they — where you can really see all the different flowers. Whoops, I think I just posted you my reply to Linda! Our internet is playing up…. That zinnia really is lovely Cathy and I am glad I still have some of the seed left but will try and find the same mix again anyway. What a scrumptious vase! Perfect for a table setting, where the best of the garden can be shared but not high enough to hide anyone! Happy Monday Cathy! Precisely! 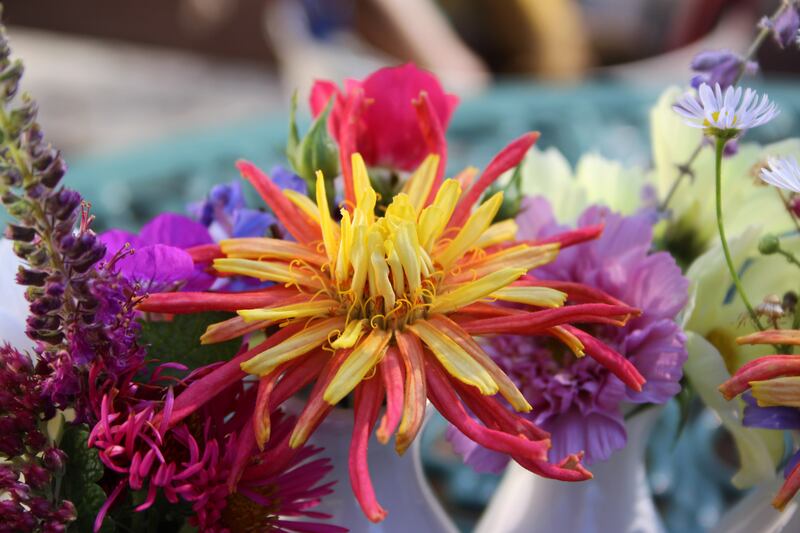 It is perfect for the table and everyone can see the individual flowers too! Have a great week Deb! That is one great vase, Cathy. And it is filled to perfection. Nice. Lovely, vases in a vase, my favourite type!And such a cheerful mix of flowers! 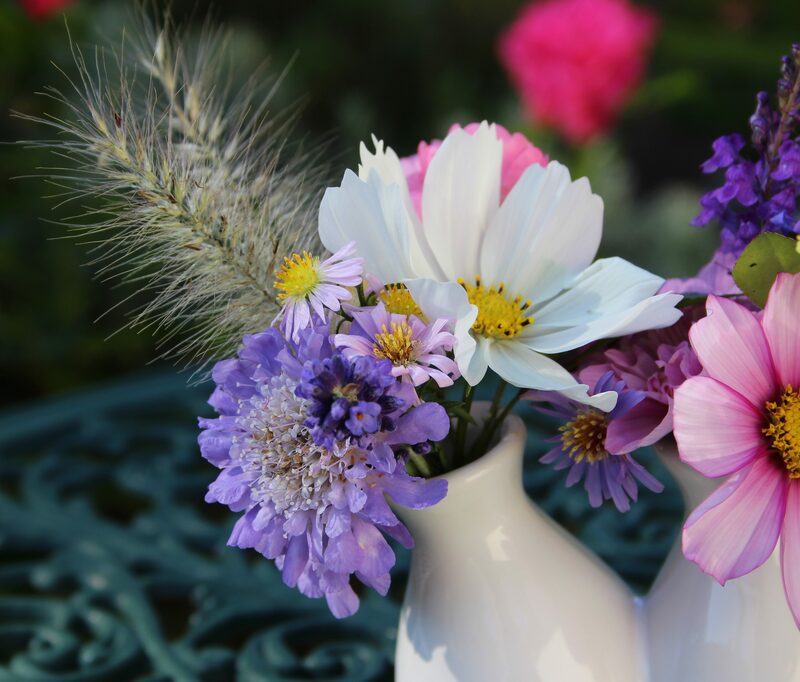 It’s a fabulous collection of flowers for mid-October. Very lovely. Your new vase is so cute! I especially like that the piece on the far left tips to the side, as if it slid in with its pals at the last minute. All the flowers you includes are wonderful but I remain thoroughly enamored with the cactus zinnia. Oh yes, you’ve described that left-hand piece very well Kris! LOL! I am also in love with that Zinnia. I wasn’t too sure about zinnias in the past, but this one has won me over! Our first cold front arrives Saturday, temperatures that would make you laugh probably. But I am going to plant my Cactus Zinnias ! I do love the late Autumn flowers and the mixture. I’m enjoying seeing such a variety of vases. I cannot believe that I don’t possess a single vase. Today I’m using old kilner jars given to me by a favourite great aunt. She was very keen on preserving fruit and making jam. Such happy memories of a kind and loving relative. 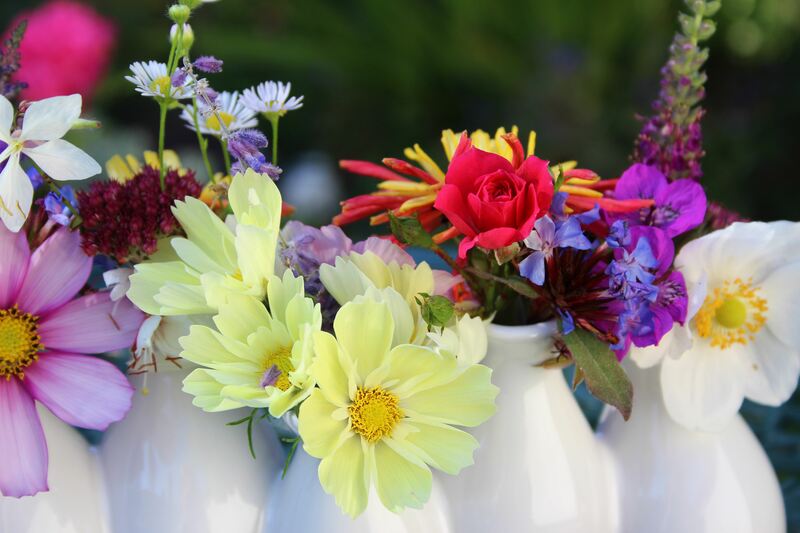 How pretty, your new vase is ideal for displaying posies. Great for the table. I love it. And what a lovely selection of flowers you have found for it. I adore that vase and the flowers are just lovely, with the prettiest zinnia I have ever seen. What an impressive variety of colourful blooms you have for mid-October. The vase looks great and I am betting will be much used. Oh yes, those Cactus are real eyecatchers. I think you should try some of those as they do make a great display. 🙂 There are different seed mixes available in various parts of the world. The flowers are a joy and the new vase is very covetable. Thank you Christina. Missed you this week! Sorry Cathy, too much to do and too little time. I’ll be back next week hopefully. Such an interesting vase and lovely filled with blossoms. Thank you Uta. We have had a lot of rain and the flowers are fading fast, but the autumn foliage all around us is lovely! We have got only a little rain. It looks still green. What a delightful gift! I like the way they’re leaning this way and that and that they are easy, as you say, to fill. Your flowers are gorgeous and so are hers. What a fun addition to your vase collection. Yes, they actually look a little tipsy the way they are leaning! 😉 I shall have fun with them for sure! Your dancing vase will always find willing partners, I suspect. What a sweet nestling of vases Cathy. You must have been delighted with such a gift.